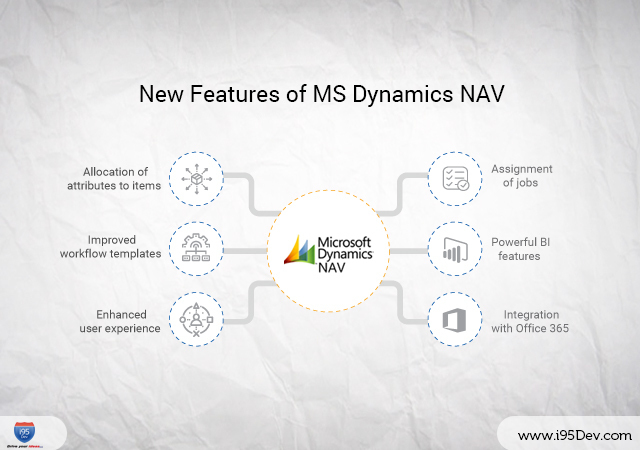 Dynamics NAV added many features over the past few years and expanded its functionalities. Some of the features of NAV added to its repertoire are based on users’ feedback. Some of them are item attributes, proper classification of jobs, assigning workflows and vendor approval. The new features of Dynamics NAV ERP make it one of the best ERP option in the market out there. This article discusses some of the key features of MS Dynamics NAV and how e-commerce industry is set to benefit from it. If you are looking for business benefits of Magento NAV integration, make sure to read our blog. E-commerce businesses heavily depend on the flexibility to highlight their product. Dynamics NAV allows its users to create custom attributes and assign specific values to the items. This makes product management very simple and gives the online store owner the much-needed flexibility. Items’ custom attributes and default parameters are very similar in behavior. Mundane tasks like filtering or segmenting items based on these custom attribute and value are made easy. This will result in resources spending less time searching for items and more time working on productive tasks. Workflow customization is a great addition to Dynamics NAV ERP. This feature enables businesses to define workflow specific to their business with help of tasks and triggers. This feature puts power in the hands of the Dynamics NAV administrator. In case the NAV admin is a rookie, the template library can act as a great starting point. Critical tasks like delayed shipments, exceeding credit limits, taxing and even foreign exchanges can be automated. Notifications are pushed to the respective managers for approvals, as part of the workflow. Dynamics NAV has a great user/client experience. Dynamics NAV can send contextual notifications to its clients. This feature of Dynamics NAV is great as a user can choose as to what notification they see. This helps the NAV use to stay up to date on only specific customers, or items based on value or attributes, or if the stock is below the threshold limit. Job module has improved dramatically in the recent versions of Dynamics NAV. This feature helps in streamlining the workflow. Repetitive tasks are added as jobs, with clear input parameters and the details of the job. The ‘Project Manager Role Center’ feature of this module helps access important information such as actual cost and budgeted cost of the job, the profitability of the job and the job actual price to budget price. This helps the project manager to quickly access tasks of high importance, create new tasks and even create New Job lists, access to sales invoices, purchase orders, timesheets etc. Assigning, planning and implementation of a Job is made super easy and intuitive with this enhanced ‘Job Module’ that Dynamics NAV has to offer. Dynamics NAV users can use this feature to gain insights into their business information and extract the value out of them. ‘Power BI’, Microsoft’s powerful analytics tool is embedded in Dynamics NAV. Critical elements like those that supply chain, financials, manufacturing, and operations can be analyzed and turned into actionable insights. There is no more the need to hunt for data from various systems and the cost incurred due to them. MS Office 365 now works seamlessly with Dynamics NAV with Outlook and Excel. Dynamics NAV users can now send the required documents to their contacts through Microsoft bookings and Outlook. With this new feature, viewing dashboards of vendors and customers, creating offers for customers and vendors are made easy. The synchronizing of contact list from with Office 365, creating email templates, adding invoices to customers based on entries in Outlook are some of the many features of this NAV Office 365 integration. Make sure to read our other blogs on how to identify the need for a Magento NAV integration. i95Dev helped many e-commerce companies design and build search functions to suit their needs. We have deep experience in strategizing, planning and executing a Magento development lifecycle. We helped many companies build customized ecosystems to suit their needs. The ERPs they use include Dynamics GP, NAV, AX, SAGE 100 and SAP B1. We have customers who are on various versions of Magento, both on Community Edition and Enterprise Edition and at different levels of growth cycles.